The fans had been expecting him since 2006, when he last performed in the antic theatre. 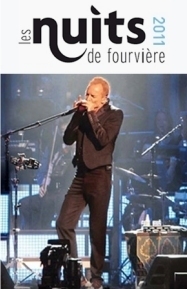 For his big return to Fourvière (Lyon, France) last Thursday for his big 'Symphonicity' concert, the English singer performed during over 2 hours a wonderfully reorchestrated show of his hits from his solo career as well as from the Police era in front of won over crowd of 4,500 people. All kept their fingers crossed. On the Facebook page of the Nuits de Fourvière(2), messages poured in all day: would the concert take place despite the forecasted rain? It had already played a bad joke on the singer in 2006, pouring continuously during the whole show. At 7 P.M., one last thundering shower still holds the suspense. At 9:25 P.M., when the National Orchestra of Slovenia comes on stage, the doubts are removed as are the clouds. The conductress Sarah Hicks switched the tail coat for legging pants and a scaled dress. She takes her place on the stand. Dominic Miller and Rhani Krija, respectively guitarist and percussionist, Jo Lawry, brilliant chorus singer, and Ira Coleman, the calm double bass player, already took their spots on the stage. Sting arrives from the left side. Thundering applauses. The first notes of "If I Ever Loose My Faith In You" come from the symphonic orchestra. On the microphone, the Englishman lays his voice. Casually leaning on the microphone holder, he masters the words. The song loses nothing of its strength though. It even reinforces thanks to the symphonic orchestra, going from energetic to grandiose. The pace is given for the two hours of the concert, interrupted by a 15 minutes entr’acte. Then Sting goes on: "Englishman in New York", "Every Little Thing She Does Is Magic". Each song is the occasion for the singer to give more and more space to his orchestra: violin solo, double bass solo, and trumpet solo. Each instrument sent to the front of the stage is accompanied by the master, who mimics in rhythm every violin bow stroke. His head follows the controlled offbeat tempo of the drummer. Sting lives is music. The orchestra then gives a masterly introduction, brass and strings in unison. The gong gives an organic depth to the overture. Behind his microphone, Sting starts singing "Russians". The monumentality of Fourvière echoes in the orchestration, worthy of the site. "Next to you" closes the first part. It is 10:30 P.M., the fans are craving for the second half of the show. No one leaves its seat, sometimes harshly acquired. In the pit, which was left in its standing configuration for the occasion, the quality of the show and of the orchestra are praised, so is the vocal purity of the singer. That Thursday night he never fails. The voice is mastered, and some variations reveal an incredible power. The second part focuses Sting's solo songs. It starts with "Shape of my Heart". "All Would Envy", "End Of The Game" and "King of Pain" give way to one of the most famous song of the singer: "Fields of Gold". The orchestration is faithful to the album, with an extra monumentality. The ballad transports and transcends. Sting goes on in the same path with "Fragile" before launching "Every Breath You Take". In the crowd couples hug, kiss. The 4,500 lucky ones accompany the singer on the verses and the refrains. First departure of the singer, who takes away the conductress backstage. In the orchestra all remain seated. The audience is not fooled and knows it's only a mock ending. First curtain call with the mesmerizing "Desert Rose", originally sung in duet with Cheb Mami. The oriental voice variations are entrancing, and the voluntarily repetitive musicality of the song prompts to reverie. Sting leaves once more. The orchestra still does not move. The singer comes back with "She's Too Good For Me". He then ends the show for good with his acoustic guitar on "Message In A Bottle". The audience takes on the world hit by the Police. In the crowd, the traditional "cushions shower"(4) turns to a downpour. The rain, the mischievous real one, comes with a few drops on the last song. Like a merci from the sky. 2006 and its rain storm now belongs to the past. Sting put a magical spell on Fourvière, who will remember for a long time. (1) the hill where is located the 2000 years old Roman theatre in which the concert takes place. (2) the summer festival which takes place each year in the Roman theatre of Fourvière. (3) the hill of Fourvière has many convents and churches, which is why it is nicknamed the "praying hill", by opposition to the "working hill" of La Croix-Rousse where manual silk labourers used to inhabit. (4) before the concerts the audience is always given inflated plastics cushions to help enduring the Roman cold stone seats; traditionally, when a concert is appreciated, all the cushions are thrown in the air at the end of the show.